License to Chill Snow Island is Open! Pffft. A little rain couldn’t ruin all the plans for the perfect Winter Wonderland at Margaritaville at Lanier Islands. Everything’s just swell, now that License to Chill Snow Island is open! Hearing that License to Chill Snow Island is open through Sunday, February 24, 2019, gives us even more to be thankful for during the holidays. Margaritaville at Lanier Islands now has the fastest hill in America for snow tubing — right here in Georgia on Lake Lanier! That means you can ice skate and play in the snow all day and still enjoy grilling out on your deck on the same day. Yup. That’s how cool it is to live near Lanier. Enjoy a lap around Lanier Islands’ giant Magical Nights of Lights before or after tubing. 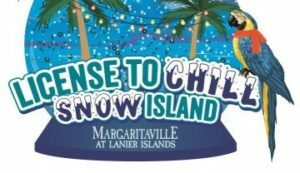 Margaritaville at Lanier Islands spared no expense to make License to Chill Snow Island one of the best winter attractions in the country! 13 winter-themed carnival rides with Bumper Cars, a Ferris Wheel and more. The fastest snow-tubing hill in North America with ten 400-foot long lanes! Firepits for roasting marshmallows, making s’mores and not freezing to death. A snowball fight area at LandShark Landing, complete with throwing targets by the lake. Purchase a season pass and enjoy the fun every day that License to Chill Snow Island is open!